For the last two weeks we’ve been testing out the Tefal GC713D40 OptiGrill here at Vivre Le Rêve HQ. As you all know by now, we love our kitchen gadgets. This is a wonderful bit of kit. Everyone has heard of a George Foreman grilling machine, so think of the Tefal Optigrill as like that but far more advanced. It’s a simple case of plugging it in and pressing the on button. You then select which type of food you wish to cook. The Optigrill will begin to pre-heat for a few minutes and will give you an audible cue to let you know it’s ready. Next, you place your food on the grill and close the lid, it should then automatically determine the thickness of the food and adjust its timings accordingly. 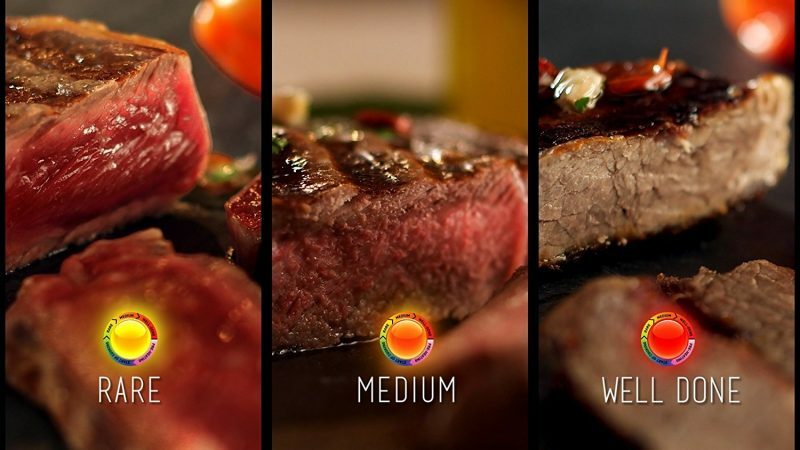 The large LED light on the right hand side will then cycle through colours until you reach the desired corresponding cook level, again with audible cues. Being a fan of medium rare steaks this thing cooks them very rapidly and with consistent results. Unfortunately, you won’t get the same sear that you would from a high heat pan, which is a bit of a trade-off, but the results it provides are worth it. 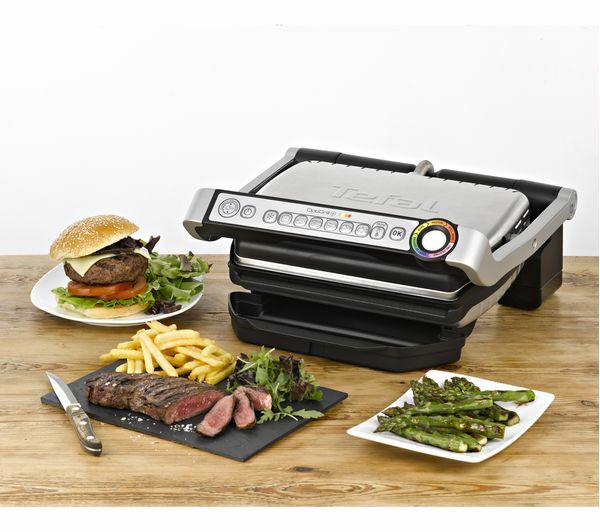 So far we’ve tested out the Tefal GC713D40 OptiGrill with sirloin, fillet steaks and homemade burgers. The burgers especially come out superbly every time. We love that you just load on the meat and it does the rest. It takes 8-10 min to preheat and then maybe 5 min to cook a steak to medium. It beeps and flashes at the end of each cycle rare, medium and well done. Also the coloured LED gives you an idea of the steaks interior colour as it cooks allowing you to stop it at just the right moment. It measures the thickness of the meat and computes the cooking time accordingly and it works. Also, it does not flood the kitchen with smoke, the juices flow into a collection tray and it’s all relatively fuss free. Cleaning of the Optigrill is pretty straightforward. The two griddle hot plates detach from the main body for easy cleaning, as does the fat drip-tray. As with any griddle cleaning the grooves can be a little time consuming, but I recommend buying a griddle sponge or brush to overcome that. It’s not the cheapest grill around, but crucially I know that it will be one of the most commonly used. I’m into gadgets for the kitchen and will buy almost anything. Some have been good purchases and some have not, it’s part of the fun. But this ticks all the right boxes for me. It cooks to perfection, it’s easy to use and easy to clean and is totally idiot proof. Highly recommended for those who are beginners to cooking and to those with a bit more experience. 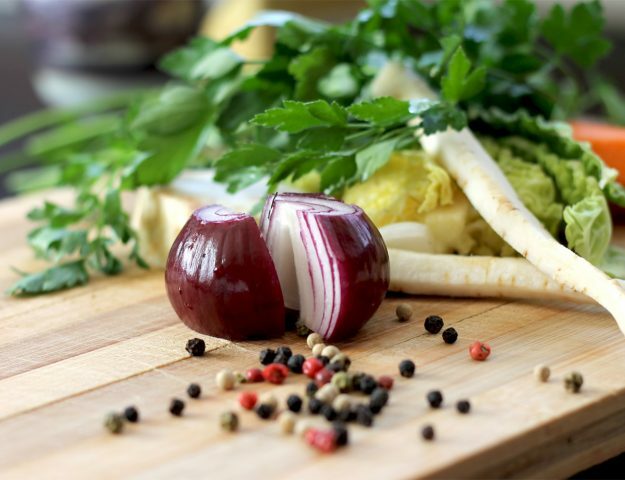 Cooking and eating is about to get a whole lot better. Very simply, we love this grill. It makes it so easy to make any type of food that requires a hotplate. Steaks, burgers, paninis and toasties, superb! 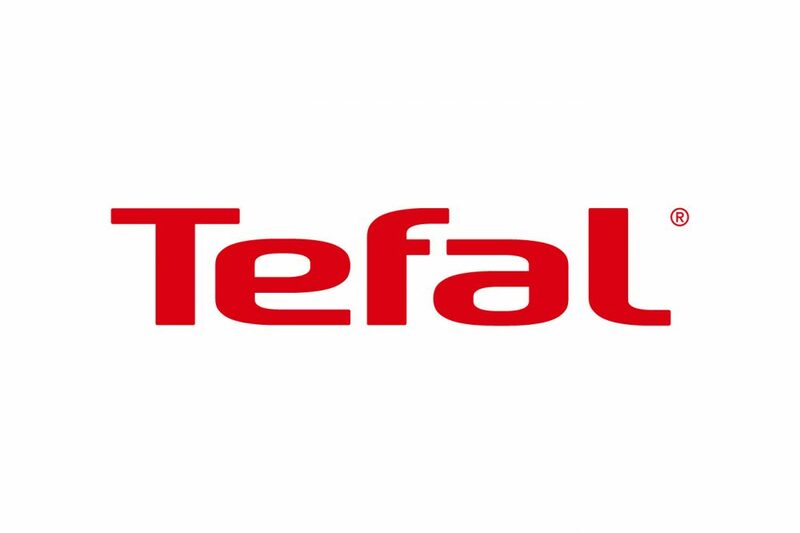 The Tefal GC713D40 Stainless Steel OptiGrill Plus Health Grill is currently available from Amazon for £109.99. For your chance to win one of these essential pieces of kitchen kit for yourself. Just enter via the Rafflecopter below, good luck!